A 1-D Acoustic Flow Meter for measuring stream velocity in depths down to 2cm. 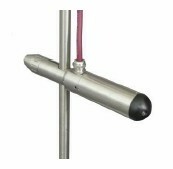 A 2-D Acoustic Flow Meter which measures velocity and depth in each vertical with just one reading. Due to parts obsolescence, we are unable to manufacture any new Gauging Loggers. Support and repair services for existing units will continue for the forseeable future. The OTT ADC (Portable Acoustic Digital Current Meter) is designed for point velocity measurements in natural streams, rivers, creeks and open channels. The C2 Small Current Meter is used for measurement of flow velocity at low water levels. C31 Universal Current Meter is designed for flow metering in combination with hand-held wading rods or cable suspended from a bridge or boat. The Nautilus C 2000 Electromagnetic Flow Sensor is designed for the portable measurement of very low flow velocities from 0.000 m/s up to 2.5 m/s (standard - other ranges upon request).